One day Athena gave them a basket. In it was the boy Erechthonios and with him - or part of him - was a snake. The three Dew Sisters were ordered to take care of the basket and the boy in it, but to never ever look inside. While Pandrosos cared about what the goddess ordered, here sisters chose to be disobedient. They opened the basket and saw the child and snake. As a result they went mad and lunged themselves down the Acropolis. Each pattern can be bought separately, too. 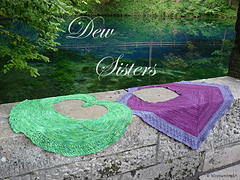 The patterns share some common features: each of them combines different textures and each of them has a more or less easy lace pattern at the edging.